Morpho, through its U.S. company MorphoTrak, has received factory certification from Lenel Systems International and joined the Lenel OpenAccess Alliance Program. Morpho biometric access readers now interface with the OnGuardaccess control system through BioManager middleware by Identity One. Lenel is a part of UTC Building & Industrial Systems, a unit of United Technologies Corp.
With the certification, OnGuard customers can now interface Morpho’s biometric readers to their security installations through BioManager middleware by Identity One. BioManager incorporates Morpho’s fusion fingerprint and vein, fingerprint and 3D face biometric readers with the OnGuard system by Lenel. DERMALOG Identification Systems is installing a nationwide system for the Nigerian financial system to identify all bank customers by fingerprint. The first phase is operational. The program will enable the customers of all Nigerian banks to identify themselves at ATMs or at the checkout using their fingerprint so they can withdraw money or pay for goods. M2SYS Technology, announced that it will support Integrated Biometrics’ “Sherlock” LES fingerprint sensor – a non-optical fingerprint sensor to achieve FBI Appendix F certification. As biometric identification deployments increase globally for national ID cards, voter registration, border control, and e-passports, demand has risen significantly for mobile devices containing fingerprint sensors that are capable of capturing images from moist to dry fingers in any type of weather conditions. 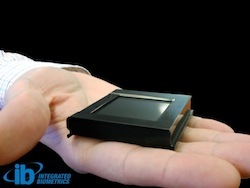 Integrated Biometrics’ FBI Appendix F certified “Sherlock” fingerprint sensor is a lightweight, compact, durable, accurate, secure sensor that provides the forensic-quality roll image in the smallest and lightest form factor available on the market today. Hoyos Labs, a digital infrastructure company, has provided a $78,000 research grant to Villanova University in the area of computer security focusing on identity assertion, role gathering, adjudication and access control. Hoyos Labs’ identity assertion products use a multi-biometric recognition system that includes the face, periocular region and iris to confirm one’s identity. The technology leverages smartphones via its app, Hoyos ID, as biometrics acquisition devices (on the front-end), interacts with middleware and accesses the back-end before identity authentication. This system tackles the unmet needs in identity security, such as incorporating “liveness,” which detects a real person from an image or video in a quick and easy-to-use manner. Adjunct Professor Scott Streit and Pritpal Singh will lead the research project. Streit is a computer scientist who specializes in semantic web, cloud computing and relational database processing and has led projects for the Apache Foundation and U.S. government. In December 2013, he was appointed Chief Computer Scientist for Hoyos Labs, where his role is to architect and engineer Hoyos Labs’ new identity assertion platform, overseeing the front- and back-end of the technology, as well as the Amazon Web Service and clients’ enterprise systems.